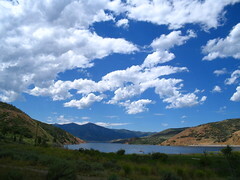 I spent the last three days camping at Utah’s Jordanelle Reservoir state park. It was very beautiful, and very fulfilling. It was good to get away from the computer for a bit, and exchange it for a good dose of clear air, warm days in the sun, and relaxing evenings by the fire. My only complaint about camping is that to stay clean, one must be quite diligent. But hey, I won’t complain about it too much, as it did get me out of the office, and aside from the work it was to keep bugs away, and keep the crew fed, I had plenty of time to relax, talk, read and nap.